I’m going to be very open and transparent with you today and tell you about a season I went through recently that hurt. A Special Offer of “Arise, Shine” and Your 19 FAQs About Entering Your New Season. I don’t blame you for wanting to know if your new season will hurt. The thing is, though, most seasons are NOT going to hurt hurt. The Kingdom of God is in righteousness, peace, and joy, and God wants to bring us into greater measures of those things. Always. But sometimes you have to go through a process to get to that next level of peace and joy. Sometimes there are seasons in which He allows a stripping away of things that don’t look just like Jesus. Or, there are seasons in which you’re tested on things you’ve learned. Or, there are times when, like Job, He may allow something difficult to happen in your life because He needs a big fat giant for you to kill so you can become king. He’s ready to promote you, but sometimes there has to be a dying first. Even if you have to endure a painful season, God will work it out for your good and use it to promote you. Therefore, there’s no reason to fear; even the hardest things will elevate you to a new level in Christ and bring you further into your destiny. It’s true, every time, because He promised. As I mentioned in Heavenly Downloads For Your New Season, God told me I had entered into a new season at the end of Memorial Day weekend this year. It was right after I took a team to give free dream and tattoo interpretations at the tattoo convention. Our team had experienced a crushing victory there, encouraging so many people and seeing God love on hungry, hurting hearts. Therefore, reasonably so, I imagined that the new season would be a season of further victories. I was very excited about that possibility. But very quickly thereafter, something terrible happened. Someone I loved stabbed me in the back really hard and, figuratively speaking, left me for dead. I felt like they had ripped out my heart. I was bleeding all over the parking lot, and I had no emotional or spiritual life remaining in me. It was a really hard time. I wanted to walk away from ministry and God’s people forever. I didn’t want to love people anymore, because love hurts. I wanted nothing to do with anyone and was ready to walk away from all relationships except my marriage. I heard it as clear as a bell. And trust me, it was not what I wanted to hear. Uhhhhh… on second thought, Jesus, can I get out of this new season, please? I didn’t do anything to deserve this. So I’d really appreciate it if You’d reverse the circumstances and stick up for me. Smite ’em, God. But Jesus answered them, saying, “The hour has come that the Son of Man should be glorified. Most assuredly, I say to you, unless a grain of wheat falls into the ground and dies, it remains alone; but if it dies, it produces much grain. He who loves his life will lose it, and he who hates his life in this world will keep it for eternal life. If anyone serves Me, let him follow Me; and where I am, there My servant will be also. If anyone serves Me, him My Father will honor” (John 12:23-26). Agree with your adversary quickly, while you are on the way with him, lest your adversary deliver you to the judge, the judge hand you over to the officer, and you be thrown into prison” (Matthew 5:23-25). “Blessed are you when they revile and persecute you, and say all kinds of evil against you falsely for My sake. Rejoice and be exceedingly glad, for great is your reward in heaven, for so they persecuted the prophets who were before you” (Matthew 5:11-12). “Remember the word that I said to you, ‘A servant is not greater than his master.’ If they persecuted Me, they will also persecute you. If they kept My word, they will keep yours also” (John 15:18-20). There were lots of other Scriptures that the Lord brought to my attention, but I don’t have time to list them all here. Suffice it to say, they were all about dying to oneself, making things right with your enemies, and not expecting people to just love you all the time… but forgiving them anyway. Either I could dig my heels in, fight on my own behalf, and try to prove the other person wrong … which would only mean I’d get to go around and around this same mountain, experiencing who knows how much more agony, until I finally submitted. OR, I could accept that the Lord told me it was a season of death, submit to His Word NOW, and let Him do His thing. And hopefully get it over with quickly. I realized that the first option would only work out badly. That left the dying part. I wanted to get THROUGH this season and leave it behind me, so I decided to jump on God’s bandwagon and die to myself in this. So I did. After the initial gut reaction, I didn’t lash out. I was hurting, but God helped me. I forgave, tried to make things right, and somehow got through it. And you know what? After I got on God’s bandwagon and submitted to His work, it turns out that this rough season didn’t last very much longer. And at first, I almost had to pinch myself. I didn’t think I heard correctly. How could such a season be so short? Surely I needed to suffer longer? But no. Even though I didn’t quite believe the season of death was over, I started seeing new life right after God switched the seasons. I started seeing the promotion and open doors I had hoped for. And ever since that time, I’ve been in a season of vibrant life. God has done things that were beyond my wildest dreams. But looking back, I can see that God used that season of death to promote me. He strengthened my faith and prayer life, because I prayed continually and claimed His promises about working things out for my good during this time. He taught me that the words that Jesus speaks are spirit and life; that soaking in the words of Jesus will revive even the most wounded heart. This is a key lesson not only for myself, but also that I can pass on to the people I mentor. He’s done other, bigger things that I won’t mention, but you get the point. So in the end, I didn’t need to fear the new season of death… because God had promotion in line all along. I had an enemy and that enemy hurt. BUT GOD planned to work it out for my good all along. He just needed me to cooperate. … the Word of God will hold true for you. God has promised to work all things together for your good, and He. will. do. it. You don’t need to fear your new season. Even the worst-case scenario–a painful season–still can’t harm you. God will work ALL THINGS together for your good. He has promised, and God is not a man that He should lie (Numbers 23:19). He will ALWAYS keep His promise to you. So you can enter into your new season with joy and expectancy now. Get His downloads and His specific prayer directives. Ask Him what He wants to do in your heart next. Go on your vision retreat (even if that’s in your bathtub!) and ask Him what your next step is. There’s no need to fear. 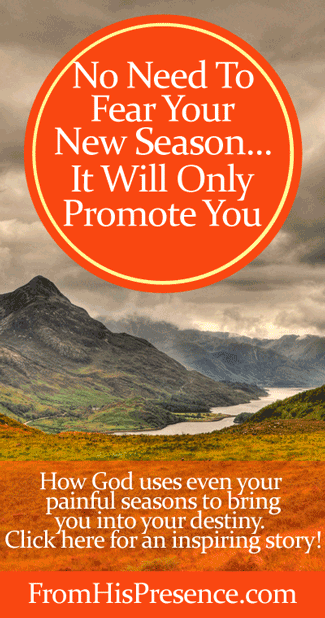 No matter what your new season looks like, it will only promote you. God is in charge, and He will perfect all things that concern you. Image courtesy of mendhak on Flickr via Creative Commons license. Image has been edited and the text and graphics have been added. Hi Tiffany! I’m so sorry it took me awhile to respond. I’ve been away from the computer for several days. Thank you for reading! I totally agree with your thoughts. It’s in that painful death that the life of Christ comes shining through in blazing glory. I’m so grateful for how He turns our mess into a message and a testimony of His goodness and salvation. I’ll check out your story too! Have a great night! Thank you for these wise words. I have been going through a very difficult season, and reading these words made me realize that I am the reason this season has gone on for so many months! I feel prepared to take the next steps with the help of Jesus, so that i can be promoted! 3 words struck me. Choose.Submit. Graduate. I’m graduating from a season that has often been painful but oh so beautiful and valuable. It was a season involving the aftermath of some bad life choices and their consequences. I had to choose my course. Jesus took me by the arm and said “Come with me and I’ll walk you through this.” It was hard. It was painful. It hurt. But I was never alone. Every time I would waiver, doubt, start to falter, He would faithfully give me a rhema Word or send a laborer to help me keep on going. Amazing Love. What I’ve gained during this season is invaluable and I ‘m now seeing the restoration of things I had lost! Every season has a purpose. He wastes nothing! Awesome thoughts, Katie. Totally awesome. Thank you for sharing! You are graduating into a wonderful thing and I’m so excited. I love how Jesus walks with us and the Holy Spirit draws us and woos us back to the Father’s table. We cannot draw ourselves! “While we were yet sinners, Christ died for us.” Thank You, God! And I praise Him with you for His restoration! Thanks for posting about this very difficult time in your life. There are times I need to remember that it’s not about me and that wisdom from Heaven causes us to walk in humility. When we decrease and He increases, the end result is so much better, but getting there can sure be a stripping process. James 3:17 says that wisdom from Heaven is first of all pure, the peace-loving, considerate, submissive, full of mercy and good fruit, impartial and sincere. Lord, during hard times, please draw us to Your wisdom and give us daily strength to walk it out. Hey Denise. Sorry it took me so long to respond – I’ve been away from my computer. Thank you for reading and sharing. I totally agree. I love that passage from James and pray for wisdom like that often. Only the Holy Spirit can produce it, but He is faithful to do so and I’m grateful! Hey Leslie, I’m so sorry all those terrible things have happened to you. But I am praising Jesus with you for His faithfulness in your storm. I pray that your new season would be full of restoration and blessing, and that you would receive a double portion of grace, favor, provision, and restoration in exchange for everything you have lost. God, RESTORE by Your mercy and the blood of Jesus! 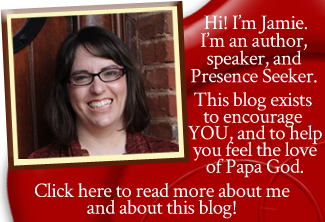 thank you for your blog post. Diagnosed with a rare form of breast cancer, so I’m starting a new season. Your thoughts are helping me with the transition from fer, to one of walking my journey with the Lord. Hi Sunny. I’m so glad it encouraged you. I am sorry you are going through a tough time, but I’d like to speak to that cancer if I may: I speak to the cancer in you and I curse it and command it to die. I speak to your body and I command it to live. I loose healing, health, strength, and regeneration into you in Jesus’ name, because by the stripes of Jesus you are healed! Now Lord, let Your Word run swiftly into Sunny and bring her total and complete healing in Jesus’ name because Jesus already paid the price for it!!!!!!! Thanks for reading my blog, Sunny. I pray it will continue to encourage you. Really appreciated this article. I am in the midst of my season of death and it is painful. But, through it God has revealed why this has been necessary even now in my darkest hour I know dawn is about to break. We either trust or we don’t no shades of gray here. We either choose the light or to stay in the dark, I am choosing the light, I am choosing to trust 100% and as bad as things are right now I have such peace & joy I wouldn`t trade for any amount of gold. Reflecting on this God revealed to me that when I started the journey that I am on with Him I was in a place of trust and in that place there were shades of gray. I trusted Him with some things and didn’t others. Taking me to a place of TRUST is where it has become black and white for me, I TRUST Him. When I was in the area of trust where there were shades of gray self-was involved. Now that I am in an area of TRUST, black and white, self has died. This has been a year where I have traveled from faith to FAITH, belief to BELIEF, love to LOVE, trust to TRUST and prayer to PRAYER. Dearest sister Jamie, again thank you as this message is so perfect with it’s timing. I am in awe at God’s mercy and love for all of us. Thank you for sharing the agony of your pain, and thank you to all those that have responded with replies, and how God is so big and knows all these hurts and all this pain….Hallelujah for His endless love. Without going into much detail right now, I will add that I also experienced a season of death as my son has turned against both his father and me…I have never experienced such horrific pain mentally and physically and the anguish was numbing. I did shut out everything, and everyone except for my husband, but the time that I’ve had with the Lord was so needed because I needed to die to self. I shut out every thought, every worry, every person except God, Jesus and the Holy Spirit…I forgot how sweet the feeling is when I’m immersed in my Heavenly Father’s presence. I allowed life, worries, complaining and self pity to get in my way…and how easy it is to just shut out all that, then just turn to my Heavenly Father for what I needed. WOW, so difficult to face the truth…I prayed that God would reveal all to me, and I confessed all, and forgave all, and feel that the new season is going to be blessed with all that the Lord has for us through prayer and supplication with thanksgiving for this fresh oil that has been provided to go forth and share God’s promises. The pain was deep, vast, and the wounds were crippling, but all glory to Him because for as deep and vast the hurt, God is filling us to overflowing with His fullness. I pray for you and your family, and each of your followers that … Ephesians 3:19 and to know this love that surpasses knowledge—that you may be filled to the measure of all the fullness of God. This post spoke volumes to me. I have been around the same mountain for years. I got the answer. Thank you for sharing. I will “submit to Him and His Word and let Him do HIs thing”. This is so good. I had a dream this am and someone said to me, “they are going to ask for your resignation.” I asked who & all I heard was ‘Good Ole Boys.’ Just before I was told this I was handed a note folded up & I put in my pants pocket. When I awoke I was really light headed and very dizzy! I was all day. I really believe God is telling me I need to die to myself which brings me to your word. I really believe this is a season of dying & that God will use it. Awesome Word & Thanks so much! Thank you Jamie for this timely word! I had a incredible caregiving job, the lady I cared for was a Christian, we experienced great times in the word and had a great relationship. Then out of nowhere I was fired. My heart is crushed and I feel like a received a death blow! The reason for letting me go didn’t seem to fit with my relationship w this lady. But I’m seeking the Lord now for what He wants to reveal to me about this next season. I sense the Lord is saying Seek Me while I may be found, call upon Him while He is near. Thank you for your words of life in a difficult time. I will wait upon the Lord and rest in His abundant peace.